Laser therapy is the use of monochromatic light emission from a low intensity laser diode or an array of high intensity super luminous diodes to treat musculoskeletal injuries, chronic and degenerative conditions and to heal wounds. 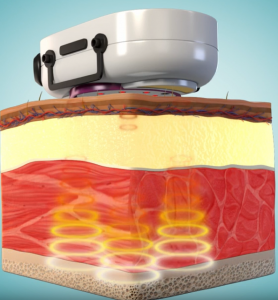 The light source is placed in contact with the skin allowing the photon energy to penetrate tissue, where it interacts with cellular function restoring normal cell function and enhancement of the body’s healing processes. The following points will outline the specific effects of Low Intensity Laser Therapy. Absorption as a result of photon bombardment of various cellular molecules results in the transformation of light energy into biochemical energy. This is a cumulative effect and requires sufficient stimulation in order to initiate response. Typically 6-15 treatments are required and the end result of laser therapy is the restoration of normal cell function. Normally functioning cells are not affected by laser therapy nor are there any known significant side effects. Low Laser Therapy differs from other modalities in that it has a curative effect on the body rather than simply symptom control. Although rare, should you experience any pain after treatment, use ice repeatedly for 12-15 minutes. Notify us on your next visit if this has occurred, so we can adjust the treatment protocols. Treatments are scheduled according to recommended protocols and each patient’s status; They usually start with three or more treatments per week and decrease with improvement. Treatment plans can vary from 8 to 20+ visits and acute injuries will often respond faster than chronic conditions. Remember, our objective is to get you as healthy as possible, in as little time as possible, but this will require time and patience. Low power laser is quickly becoming the first line of attack in pain control and tissue healing. It is safe, painless and provides fast results. The term laser stands for Light Amplification by Stimulation Emission of Radiation. It is a pure form of light energy of a specific color or wavelength. There are two general types of medical lasers: high power lasers – which cut through tissue, and low power lasers – which stimulate tissue repair. This is referred to as photo-biostimulation. Lasers used for tissue stimulation have insufficient strength to damage cells. However, as the laser beam is quite bright, the patient should avoid staring directly at the beam as it may irritate the retina of the eye. Over twenty years of clinical use, low power lasers have not been found to cause any adverse effects. When laser light interacts with tissue, it causes certain photochemical reactions to occur, and stimulates natural biological processes. Many of these reactions have beneficial effects on the body, which help to control pain and accelerate healing. 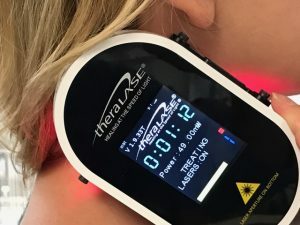 Laser therapy has been valuable in the treatment of a variety of conditions, including patients suffering acute, chronic, or post operative pain. Most conditions respond positively to laser therapy as it stimulates the reparative processes of the body. Low power lasers do not generate heat and therefore, when the laser contacts the skin, the patient experiences no warmth or burning. Although the light may stimulate certain nerves, most people feel nothing during the treatment. Treatments are generally 1-2 minutes or less per spot and most conditions require approximately 3 to 4 spots. Most visits to the office are finished in under 5 minutes and a total of 8 to 10 visits for acute injuries, and 15-20 for chronic injuries is normal. The less chronic the condition, the faster the healing time. While some patients feel improvement right from the start, it’s common that lasting improvement is noticeable after 6 to 8 visits. Although daily visits may be required at the beginning of your treatment plan, they are fast and simple. As your condition improves, visits decrease in frequency.